Roger and Mirka Federer Welcome Second Set Of Twins! Home » Roger and Mirka Federer Welcome Second Set Of Twins! And babies make 6! Roger Federer and his wife Mirka are parents again, and it’s going to busy. The Pro Tennis player announced they welcomed a second set of twins – Lenny and Leo. Earlier today Roger revealed to fans that he would be withdrawing from this week’s Madrid Open Masters event to be alongside his wife at the birth of their children. 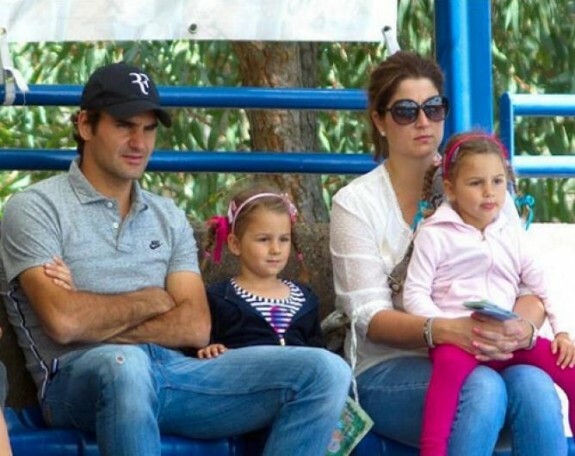 “I’ve decided to withdraw from Madrid to be with my wife Mirka during these next few exciting weeks for our family. I apologize to my fans and hope to be back in Madrid next year. I’ll be training near my home, and am excited to rejoin the Tour soon!” Roger wrote on his Facebook page. The boys will join the couple’s 4-year-old daughters Myla Rose and Charlene Riva, who are identical twins. There is no word if the couple scored a second set of identicals or if the boys are fraternal. Regardless, they are going to be very busy with four children. Luckily for them both Roger and Mirka’s mothers often accompany them when they are travelling. So hopefully they will help reduce the chaos.